On a recent trip to London, I ate this delicious autumn dessert at a very trendy restaurant called Smith’s of Smithfields. The warm apples with gingerbread cake and caramel sauce was served with vanilla ice cream — yum! To prepare the cake pan, butter a 8 or 9 inch round cake pan (should be 2 inches deep) generously. Spread the apple slices over the bottom of the pan. Sift together the flour, ginger, cinnamon, and salt into a bowl. Put the butter in a bowl and beat with an electric beater until fluffy. Add the sugar gradually and continue beating until the mixture is light and fluffy. In another small bowl, mix together the molasses, baking soda and boiling water. 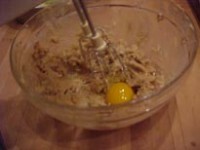 To prepare the cake batter, stir the molasses mixture into the butter mixture. Stir in the dry ingredients. Pour the mixture into the prepared pan. Place in the preheated oven for 30 minutes. 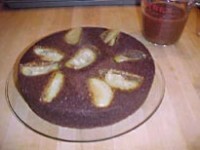 The cake is done when it is firm to the touch and pulls away from the sides of the pan. Cool the cake in the pan on a rack for 10 to 15 minutes before turning out. 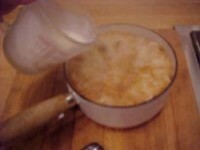 To make the caramel sauce, put the sugar and water in a medium-size, heavy saucepan. Melt over gentle heat, stirring occasionally with a wooden spoon, until the sugar has dissolved. To assemble, cut the cake into wedges, and serve on individual plates, surround with a spoonful of caramel sauce. Note: You can also make this cake as individual cakes by using 8 4-inch ramekins instead of the round cake pan.